Once again, our annual holiday remembrance service and tribute concert in honor of the loved ones we have lost this year brought families together to reflect and remember. A service filled with prayer, reflection and hope was held Saturday, December 5, 2015, at our Willow Springs location. Acclaimed Polish soprano Miroslawa Sojka-Topor provided a musical concert of classical and holiday favorites. Families lit candles and watched a video tribute of their loved ones. Afterwards, guests stayed to enjoy refreshments and each other's company. Spontaneous two-steppin' sparked at our Mardi Gras concert on February 14, 2015 as part of our 100th Annviersary Celebration. The Midway Ramblers, an authentic and fun Cajun/Zydeco band that plays true Cajun, hot Zydeco and Louisiana Blues delighted a large crowd of all ages. 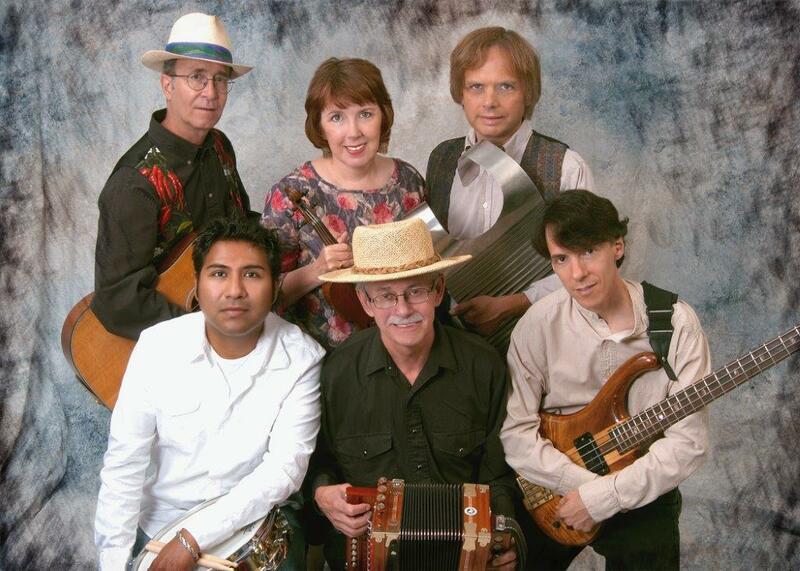 During the hour long concert, guests learned about the Cajuns: their history, culture, language and song. As well, after the concert everyone took part in authentic Cajun cuisine. Visit our YouTube page to watch a fun clip from the event. #ZMC100. More then 75 people came together December 6 to reflect, remember and rejoice in honor of their loved ones who have died this past year. Uplifting music performed by acclaimed soprano Miroslawa Sojka-Topor, messages of hope, a tribute video and a lite reception, allowed families to be a part of a supportive environment with those who are also grieiving. To see more pictures and to hear a bit of the performance, visit our Facebook Page. More than 100 people attended our annual remembrance service on December 7. 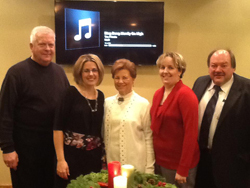 Prayer, music highlighted the service in honor of our loved ones who have died this past year. A candle lighting ceremony and a memorial video were also part of a special tribute concert featuring acclaimed Polish soprano Miroslawa Sojka-Topor. Please stay connected to our website for future events held at our locations. Zarzycki Manor Chapels, Ltd. had the privilege of honoring three graduates at Willow Springs School on Monday, May 20 with our annual educational scholarships. The funeral home has been presenting the scholarships since June 1989. Each scholarship is in the amount of $100 and is awarded to the top two scholastic average graduates. The scholarship was intended to benefit students in their initial year of high school. Charmaine Zarzycki (far left) presented the awards on May 21 at the school's graduation ceremony. The two recipients of this award were Haylee Brania (left) and Alana Mulloy (center). In addition to these honors, a second scholarship was awarded to a female graduate. The Agnes Zarzycki Achievement Award is in honor of the foundress of the family owned and operated business 98 years ago. In 1915, Agnes Zarzycki showed great courage, strength, leadership and independence within her community. Rose Mozier (right), who received a $100 scholarship, showed these qualities and more. We believe that the future lies with the success of our young people," said owner Claudette Zarzycki. "We believe that excellence in our schools is a direct reflection of excellence in leadership and that is why we continue to award our scholarships: an honor designed to identify, recognize, reward and encourage students." Charmaine Zarzycki (far right) presented the funeral home's annual scholarships at the St. Bruno School Graduation Mass at St. Bruno Church on June 4. Scholarships were awarded to (l-r) Jessica Gonzalez, Sofia Rodriguez, Zoe Duarte. On June 7, we had the pleasure of presenting our scholarships to three St. Richard School graduates at their Graduation Mass. Pictured from left to right are graduates Angela Ruiz, Alejandra Rodriguez, Claudia Szaflarski and owner Charmaine Zarzycki. Congratulations to all the graduates of 2013 and best of luck in the future! Zarzycki Manor Chapels, Ltd. held their annual Holiday Remembrance Service on Saturday, December 1, 2012 at their Willow Springs facility where more than 85 people gathered. The service was open to the entire community, and it honored loved ones who have died in the past year. Deacon Tom Hyde of St. Symphorosa Parish presided over the service, which included prayer, music and reflection to offer support, comfort and peace. A special video honored loved ones who have passed this year. Afterwards, light refreshments were served. Zarzycki Manor Chapels, Ltd. officially opened its doors Sunday, June 8 to the public during a building dedication and open house in Willow Springs. The mother-daughters team and owners Charmaine, Claudette and Andrea Zarzycki were joined by the Most Reverend Bishop Thomas Paprocki of the Archdiocese of Chicago for the dedication of the new funeral home. More than 100 people attended the blessing and ribbon cutting and over 250 attendants throughout the afternoon. Bishop Paprocki offered prayers and inspirational words during the blessing. Charmaine Zarzycki, along with her daughters Claudette and Andrea and Charmaine's grandson Aiden, cut the ribbon at the building entrance. During the open house, experts were on hand to discuss the process of preplanning, merchandise selection, funeral livery, floral selection and personalization techniques from choosing the best flowers to musical accompaniment. Mike Beenblossom of Aurora Caskets was on hand to answer any questions; Dave Moore with Wilbert Vaults provided a stainless steel vault on site to demonstrate its purpose; Mark Weber of Kloeckener Preferred Flowers presented a beautiful array of funeral floral pieces; and Rick Knuerr of Broadway Livery provided his fleet of a hearse, limo and flower car for guests to see. Music and refreshments were enjoyed by all. The Zarzycki Family also raffled off a Summer Barbeque Basket and also a Digital Photo Frame. The two lucky winners were Dorothy Szczepaniak of Chicago and Eileen Kolek of Woodridge. Each guest went home with a Colorado Spruce to plant in their garden, a gift from the Zarzycki Family and a remembrance of the special day. "We are thrilled to be a part of the community of Willow Springs and surrounding area," said Charmaine Zarzycki owner of the 93-year-old family business. Set against beautiful forest preserves, the new funeral home is located at 8999 South Archer Avenue, the second facility of the Zarzycki Family. The 11,000 square foot funeral home features an inviting lobby with a fireplace and spacious visitation chapels accented with large windows viewing beautifully landscaped gardens and forest preserves. The black-topped, lighted parking lot offers spaces for more than 85 cars and the one-level facility is fully handicapped-accessible. "My mother and late father Richard C. Zarzycki chose one of the most beautiful areas of available land in the village. The existing forests and the area's peacefulness will offer much serenity to the families we serve," said Claudette Zarzycki owner. Third owner and daughter Andrea Zarzycki, is proud to be a fourth-generation funeral director, "more and more women are studying mortuary science, and we're happy to be leading the trend." For more information please call (708) 839-8999 or (773) 767-2166 or email us. Zarzycki Manor Chapels, Ltd. held its annual holiday memorial December 6, 2008 at their Willow Springs location at 8999 South Archer Avenue. During the service, loved ones who have passed within the past year were remembered with prayer, reflection and music. For the past nine years, the Zarzycki’s have held the service with the hopes of helping families cope with their grief during a difficult time of the year. “The holidays are especially difficult for families, as it is their first Christmas without their loved one,” said Claudette Zarzycki. “Our goal is to help families through these challenging times and beyond.” Light refreshments were served after the service. For more information, please contact us at (708) 839-8999 or email us. Zarzycki Manor Chapels, Ltd. is proud to announce the recipients of their annual educational scholarships awarded at Willow Springs School. The funeral home has been presenting the scholarships since June 1989. Each scholarship is in the amount of $100 and is awarded to the top two scholastic average graduates. The scholarship was intended to benefit students in their initial year of high school. 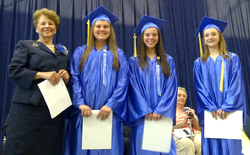 Claudette Zarzycki (far left) presented the awards on May 21 at the school's graduation ceremony. The two recipients of this award were Paulina Styrczula (center) and Nicholas Hayes (left). In addition to these honors, a second scholarship was awarded to a female graduate. The Agnes Zarzycki Achievement Award is in honor of the foundress of the family owned and operated business 97 years ago. In 1915, Agnes Zarzycki showed great courage, strength, leadership and independence within her community. Jessica Horton (right), who received a $100 scholarship, showed these qualities and more. We believe that the future lies with the success of our young people," said owner Claudette Zarzycki. "We believe that excellence in our schools is a direct reflection of excellence in leadership and that is why we continue to award our scholarships: an honor designed to identify, recognize, reward and encourage students." Andrea Zarzycki (far right) presented the funeral home's annual scholarships at the Graduation Mass at St. Bruno School on May 29. Scholarships were awarded to (l-r) Laura Guerrero, Cynthia Martinez and Luis Guerrero. On June 16, we had the pleasure of presenting our scholarships to three St. Richard School graduates at their Graduation Mass. Pictured from left to right are graduates Samantha Diaz, Olivia Garcia, Julia Stasik and owner Claudette Zarzycki. 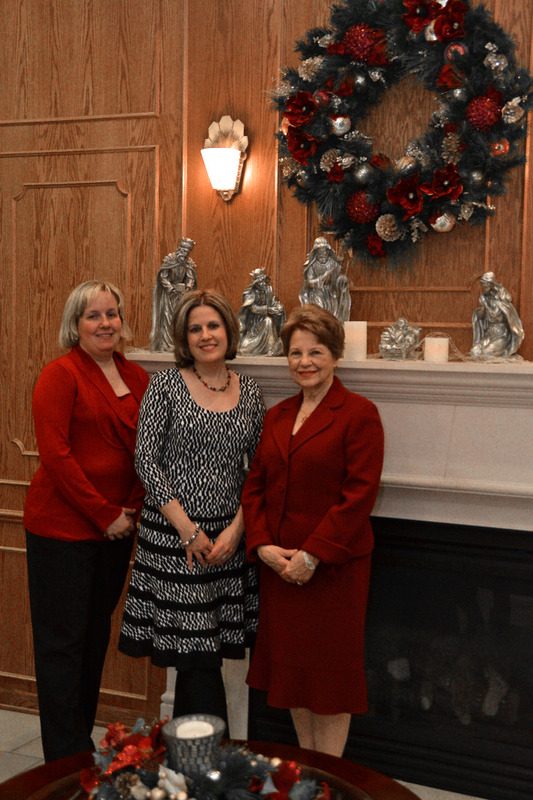 Zarzycki Manor Chapels, Ltd., annual Holiday Memorial Service was held on December 5 at their Willow Springs facility. More than 100 people attended the service that honored and remembered those individuals who have passed in the last year. Deacon Tom Hyde of St. Symphorosa Parish presided over the service; along with musical accompaniment from pianist, Kamil Bartoszcze; soloist, Ewelina Minko; and violinist, Bogdan Tomalski. A candle lighting ceremony and video tribute were part of the service. Guests stayed after the service for a light reception. Zarzycki Manor Chapels, Ltd. is proud to announce the recipients of their annual educational scholarships. The funeral home has been presenting the scholarships since June of 1989 to the local Catholic schools. Each scholarship is in the amount of $100 and is awarded to the top two scholastic average graduates. The scholarship is intended to benefit students in their inital year of high school, be it parochial or public. In addition to these honors, the funeral home also presents the "Agnes Zarzycki Achievement Award". This award is in honor of the foundress of the family owned and operated business 93 years ago. In 1915, Agnes Zarzycki showed great courage, strength, leadership and independence within her community. The $100 award is presented to a female graduate who possessed these qualities and more. Zarzycki Manor Chapels, Ltd. kicked off their Lunch & Learn series October 22 with a Breast Cancer Workshop. Nancy Amicangelo, the Executive Director of the Breast Cancer Network of Strength, led the workshop. The organization's mission is to ensure, through information, empowerment and peer support, that no one faces breast cancer alone. The workshop covered breast health awareness, early detection, proper self examination and treatment options. A short video and Q&A session completed the workshop. Guests then enjoyed a light lunch and refreshments. Stay connected to our website for future Lunch & Learn workshops. In conjunction with Ovarian Cancer Awareness Month, Barbara Wick, a representative from the National Ovarian Cancer Coalition, spoke September 19 at Zarzycki Manor Chapels' Lunch & Learn workshop program. Wick's presentation helped to understand the importance of raising awareness and promote education about ovarian cancer. A lite lunch was provided after the presentation. Stay connected to our website for future Lunch & Learn workshops. Follow along with our picture diary of the construction of our second location in Willow Springs from groundbreaking to completion. Charmaine Zarzycki with Dave TeBrake and Jesse Dumonceaux of Miller Architects and Builders. Construction progress is moving swiftly. The asphalt has been laid. Tim O. braving the first cold spell of the season on the job site. Claudette Zarzycki awarded three Pope John Paul II graduates with their annual scholarship at their graduation Mass on May 31. Emily Douglas and Alyssa Sandoval, top scholastic recipients and Anisa Izaguirre was awarded the Agnes Zarzycki Achievement Award. Zarzycki Manor Chapels, Ltd. hosted an Estate Planning workshop, Saturday, April 18. More than 20 participated in the funeral home's continuing Lunch & Learn series. Featured speakers were Corey Rybka, Attorney at Law, and Peter Kopsaftis, CEO of Global Capital. A light lunch followed the presentation for those in attendance. To learn more about the Estate Planning workshop or to be part of future Lunch & Learns, please contact Claudette at 708.839.8999 or 773.767.2166 or email us. Pictured at right are Peter Kopsaftis, Claudette Zarzycki and Corey Rybka. Zarzycki Manor Chapels, Ltd. is proud to announce the recipients of their annual educational scholarships awarded at Willow Springs School. The funeral home has been presenting the scholarships since June 1989. Each scholarship is in the amount of $100 and is awarded to the top two scholastic average graduates. The scholarship was intended to benefit students in their initial year of high school. The two recipients of this award were Jessica Jenkins and Caitlin Kent. In addition to these honors, a second scholarship was awarded to a female graduate. The Agnes Zarzycki Achievement Award is in honor of the foundress of the family owned and operated business 96 years ago. In 1915, Agnes Zarzycki showed great courage, strength, leadership and independence within her community. Victoria Baker, who received a $100 scholarship, showed these qualities and more. We believe that the future lies with the success of our young people," said owner Claudette Zarzycki. "We believe that excellence in our schools is a direct reflection of excellence in leadership and that is why we continue to award our scholarships: an honor designed to identify, recognize, reward and encourage students." Pictured left to right are Andrea Zarzycki, Kaitlyn Clancy, Sarah Salazar and Marzena Marciniec. Zarzycki Manor Chapels, along with other Willow Springs businesses, particpated in the Winter Festival held January 31 at the Community Center. St. Bruno graduates (l-r) Taylor Kubik, Sarah Pina and Daniel Wierzbicki were awarded Zarzycki scholarships by Claudette Zarzycki at their graduation Mass June 4. Kubik received the Agnes Zarzycki Achievement Award and Pina and Wierzbicki were the top scholastic recipients. Corey Rybka provides basic estate planning principles. Charmaine Zarzycki (left) of Zarzycki Manor Chapels, Ltd. presented their annual scholarships at St. Bruno School on June 1 at their graduation ceremony. (l-r) The top academic recipients were Robert Lopez and Joe Considine. Isabel Pina was the recipient of our Agnes Zarzycki Achievement Award. Family and friends gathered at Zarzycki Manor Chapels' annual holiday memorial service Saturday, November 24. Presiding was the Rev. Paul Stein of St. Sylvester Parish, along with music accompaniment by Kamil Bartoszcze and soloists Ewelina Minko & Joanna Komperda. For the past eight years, the Zarzycki’s have held the service with the hopes of helping families cope with their grief during a difficult time of the year. “The holidays are especially difficult for families, as it is their first Christmas without their loved one,” said Claudette Zarzycki. “Our goal is to help families through these challenging times and beyond.” For more information, please contact us at (773) 767-2166 or email us. Andrea Zarzycki presented three St. Richard graduates with scholarships at their graduation Mass June 14. Pictured left to right, Kaily Moore, recipient of the Agnes Zarzycki Achievement Award, and Kasia Marciniec and Georgie Bierwirth received scholarships for their high academics. Rybka and Kopsaftis provided a Q&A session after the workshop. 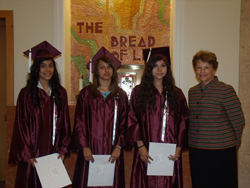 Claudette Zarzycki awarded their scholarship awards at St. Richard School on June 11 at their Graduation Mass. The top academic recipients were Molly Rademacher (far right) and Alexa Jaramillo (middle). Shannon McGuire (second to left) was the recipient of our Agnes Zarzycki Achievement Award. Zarzycki Manor Chapels, Ltd. participated in the ‘Family Fun & Safety Day’ September 16 hosted by the Willow Springs Business Owners’ Council. With the school season in full swing, the event promoted safety and also was a fun-filled afternoon for the entire family. Local Willow Springs businesses, as well as civic and social organizations were present. Activities included D.A.R.E. and internet safety presentations, the Fire Safety Trailer, face painting, coloring contest, raffles, great food and give-a-ways. Many of the activities were sponsored by the local businesses. Charmaine Zarzycki from Zarzycki Manor Chapels, Ltd. in Chicago and Willow Springs, joined professional colleagues from around the nation in Phoenix, Ariz., for the fourth annual National Funeral Directors Association (NFDA) Family Business Conference, April 6-7. This national event assists owners and next-generation staff members of family-owned funeral homes to continue effectively meeting the needs of families in their communities through superior services and community outreach efforts. Independent, family-owned businesses like Zarzycki Manor Chapels, Ltd. are essential to the well-being of the community. Zarzycki Manor Chapels, Ltd. offers a wide variety of services and programs that have a significant impact on grieving families and supports important initiatives that help create a stronger community. "Our business is based upon providing the best possible services to every family that walks through our doors," said Charmaine Zarzycki, owner of Zarzycki Manor Chapels. "We want to continue providing innovative programs and services that are beneficial to families and our greater community. We are dedicated to developing the future leaders of our funeral home who will uphold the same high standards and continue to meet the evolving needs of families year after year." Zarzycki Manor Chapels, Ltd. is a family owned and operated funeral home with locations in Chicago and Willow Springs. Since 1915, the Zarzycki Family has been servicing families of Chicago and surrounding suburbs for four generations. They are active members of the NFDA, Illinois Funeral Directors Association, United Business Association of Midway and the West Suburban Chamber of Commerce. NFDA is the world's leading funeral service association, serving 19,000 individual members who represent more than 10,200 funeral homes in the United States and internationally. From its headquarters in Brookfield, Wis., and its Advocacy office in Washington, D.C., NFDA informs, educates and advocates to help members enhance the quality of service they provide to families. For more information, visit www.nfda.org. We were featured in Monday's, June 4, 2007 edition of the Chicago Sun-Times. Click the link above to view the article. We are very positive about the future of Zarzycki Manor Chapels, our community and especially our youth. As a result, in 1989 we established an annual scholarship fund for the eighth grade graduates in local parochial parishes. This scholarship is awarded to the two top scholastic students. The second scholarship, the "Agnes Zarzycki Achievement Award" is in honor of the foundress of our family-owned and operated business. In 1915, as the first Polish-American, woman funeral director in the city of Chicago, Agnes Zarzycki showed great courage, strength, leadership and independence within her community. The female recipient of this award represents all of these qualities and much more. All scholarship recipients are chosen by their teachers. As business owners in this community, we believe that the future lies with the success of our young people. We know of no other higher achievement than that of academic excellence. We believe that excellence in our schools is a direct reflection of excellence in leadership and that is why we continue to award our scholarship: an honor designed to identify, recognize, reward and encourage students. We extend our sincere congratulations to this year’s scholarship recipients. (l-r) Mark Koziel, Kathryn Donfrio and Matthew Ziarno stand with Claudette Zarzycki after being presented with their 2007 scholarships sponsored by Zarzycki Manor Chapels, Ltd. on Wednesday, May 30, 2007. 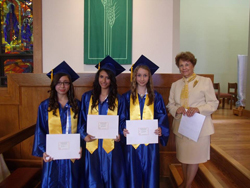 Claudette Zarzycki stands with scholarship recipients Jessica Zamora, Ana Vazquez and Yvette Cabada of Pope John Paul II School at their graduation ceremony June 2, 2007. Andrea Zarzycki presents scholarships to recipients Rebecca Schaeflein, Samantha Mackowiak and Meagan Juggan of St. Richard School at their graduation ceremony June 9 2007. Andrea Zarzycki, a volunteer with the Chicago Legal Clinic, Inc. stands with the Most Rev. Bishop Thomas J. Paprocki, President of the Clinic, at their annual awards banquet May 18, 2007 at the Chicago Hilton. SPRINGFIELD, ILLINOIS - October 28, 2010 - Claudette A. Zarzycki of Zarzycki Manor Chapels, Ltd., has been selected by the Illinois Principals Association as the IPA/Horace Mann 2010 Friend of Education Award winner. This award recognizes an outstanding individual, organization and business entity or government agency for their contribution to the field of education. The Friend of Eduation Award nominations are submitted by principals form across the state and the winner is selected by a committee made up of IPA Past Presidents. Karen Triezenberg, Principal of Willow Springs School, nominated Claudette for the IPA Friend of Education Award. According to Karen, "Claudette and her family are true friends of education. It would be an honor to recognize her for her dedication to our school and community students." The Zarzycki Family has been presenting scholarships to community schools since 1989. The family recognizes three students each at three schools with a monetary award at their graduations. Claudette has volunteered her time for various school career days, invited teen groups to their funeral home for educational tours and even hosted the former funeral director's museum on wheels for local schools to learn about the history and customs of funerals. She also develops educational seminars for community members on health awareness programs, financial planning and cancer awareness. Zarzycki family members have been educators in local school districts. Claudette's late father Richard was a Principal in Burbank, Illinois, District 111 for 19 years. As well, her mother was a teacher in the same district until she joined into the family business. Claudette's sister Casimira Gorman is a teacher at Ideal School in Countryside District 105. Claudette Zarzycki was recognized on October 18 at a special ceremony during the Illinois Principals Association Fall Professional Conference in Peoria, Illinois. An interesting article appeared in the March 2007 issue of AARP magazine. It detailed how the deceased can also be victims of identity theft. Please click the headline above to read this article. Zarzycki Manor Chapels,...keeping you informed. [Willow Springs, IL]—Official groundbreaking ceremonies of Zarzycki Manor Chapels, Ltd. in Willow Springs took place Wednesday, April 11, 2007 at 12 Noon. This is the funeral home’s second location at 8999 Archer Avenue. “We are very excited of our new venture,” said Charmaine Zarzycki, owner of the 92-year old family owned and operated business. “We were motivated by the families we serve to build a second location. Our home-base in the city will remain open to continue servicing families in the traditional way we have been since 1915.” The Chicago funeral home is located in the Archer Heights neighborhood at 5088 South Archer Avenue. The planned 11,000 square foot funeral home will feature spacious visitation chapels accented with large windows viewing a beautifully-landscaped garden and existing forest preserves, an inviting lobby with a fireplace and a black-topped, lighted parking lot for more than 85 cars. The funeral home will be on one level and is fully handicapped-accessible. “My mother and late father Richard C. Zarzycki chose one the most beautiful areas of available land in the village,” said Claudette Zarzycki, Charmaine’s daughter and another owner. “The existing forests and the area’s peacefulness is the perfect location for our plans.” Third owner and daughter Andrea Zarzycki, is proud to a fourth-generation funeral director. The mother-daughters team is truly a family affair at Zarzycki Manor Chapels, Ltd. Miller Architects of St. Cloud, Minnesota, specialists in funeral home design, developed the plans and are coordinating all construction phases. The funeral home is scheduled to be completed in late fall of this year. Pictured left to right: Brian Malone, DesignTek Engineering; Dave TeBrake, Miller Architects; Matt & Charles Kurland, Kurland Insurance; Andrea & Charmaine Zarzycki; Willow Springs Mayor Alan Nowaczyk; Claudette Zarzycki; Rev. Edward Gleeson, Pastor St. James at Sag Bridge; Tim Olinger, Miller Architects; Al Gielczewski; Mark Pesavento, Pesavento & Pesavento, Ltd.; Deacon John Wilkinson, St. James at Sag Bridge; Marion Gielczewski. Rev. Edward Gleeson and Deacon John Wilkinson of St. James at Sag Bridge Parish offered prayers and the blessing of the new grounds and building construction. Richard C. Zarzycki, owner and operator of our funeral home, passed away July 1. His visitation was Thursday, July 6, 2006 from 2-9 p.m. and his funeral was Friday, July 7, 2006. A Mass of Christian Burial was held at St. Bruno Church and he was entombed at Resurrection Mausoleum. Richard was a part of many lives in some shape or form. He will be missed greatly by our entire family and we ask that you keep us in your thoughts and your prayers. God Bless you all! Bog Zaplac! My mother, sisters and I express our deepest thanks and heartfelt gratitude for the outpouring of love and support during our time of bereavement. My Dad was a very special person. It is difficult to put into words just how wonderful he was. In short, my Dad lived a colorful and vibrant life. He was always a fair, honest and ethical man to the utmost. We extend a special and sincere thank you to the Most Reverend Bishop Thomas Paprocki, who has known my father his entire life, for celebrating his Funeral Mass. His beautiful and comforting prayers and words will remain with us. Also a sincere thank you to Father Kilian, Father Trela and Father Bernas, and to the many other priests and deacons who adorned the altar at St. Bruno in honor of my father. To the musicians and choir members for your inspirational music: My father would not have wanted it any other way. To those who sent the beautiful flowers, offered Masses, spiritual bouquets and those who will keep my Dad in their thoughts and prayers, we are forever grateful. Everyone that was present represented a chapter in my dad’s life. From family and friends, neighbors and colleagues to our professional associations, church, community, educational and fraternal organizations and to the countless families we have served over the years. All of you have a special place for my father in your hearts, and today, and forever, you have a special place in ours. My father taught all of his girls many things and always guided us down the right path. I will always be grateful for that. I was honored to work side by side with my Dad and we will carry out all of his dreams that he sought out. From the bottom of our broken hearts, we thank you and may God Bless you all. W imieniu mojej mamy, moich sióstr i swoim, chcialabym wyrazic nasze najszczersze podziekowania i gleboka wdziecznosc za tak liczne wyrazy wspólczucia i wsparcia okazane nam w czasie tego niezmiernie trudnego dla nas czasu. Mój Tato byl bardzo szczególna osoba. Trudno wyrazic slowami jak wspanialym byl czlowiekiem. Najzwiezlej mozna by o nim powiedziec, ze pod kazdym wzgledem przezyl swoje zycie w pelni. Prawy i uczciwy, zawsze kierowal sie zasadmi etyki i sprawiedliwosci. Chcialybysmy zlozyc szczególne podziekowania Jego Ekselencji Biskupowi Tomaszowi Paprockiemu, który znal mojego Tate przez cale jego zycie, za odprawienie mszy zalobnej. Piekne i przynoszace ukojenie modlitwy i slowa Jego Ekselencji pozostana z nami na dlugo. Skladamy takze serdeczne podziekowania Wielebnym Ksiezom: Ojcu Kilianowi, Ojcu Treli i Ojcu Bernasowi, jak równiez wszystkim innym ksiezom i diakonom, którzy zebrali sie dzis przy oltarzu w kosciele swietego Brunona, aby modlic sie za dusze mojego Taty. Muzykom i czlonkom chóru, za wasze piekne i inspirujace wykonania; moj Tato nie chcialby zmienic tu ani jednej nuty. Dziekujemy. Tym którzy przyslali piekne kwiaty, zalobne wiazanki, ofiarowali msze w Jego intencji, oraz tym którzy zatrzymaja mojego Tate w swojej pamieci i modlitwach pozostaniemy na zawsze wdzieczni. Kazdy z dzis tu obecnych reprezentuje pewien rozdzial z zycia mojego Taty. Od rodziny i przyjaciól poczynajac, poprzez sasiadów, znajomych, czlonków licznych profesjonalnych towarzystw, czlonków stowarzyszen koscielnych, spolecznych, edukacyjnych i braterskich organizacji, a konczac na licznych rodzinach, którym oferowalismy przez lata nasze uslugi. Kazdy z Was ma w swoim sercu specjalne miejsce dla mojego Taty, a dzis i na zawsze Wy zajmiecie szczególne miejsce w naszych sercach. Moj Tato nauczyl nas, wszystkie jego corki, wielu rzeczy i zawsze wskazywal nam wlasciwa droge postepowania. Za to bede mu dozgonnie wdzieczna. Mialam honor i przywilej pracy u boku mojego Taty, a teraz same bedziemy pracowaly nad tym by wcielac w zycie jego plany i realizowac jego marzenia. Jeszcze raz, z glebi naszych przepelnionych glebokim zalem serc, mówimy Wam wszystkim serdeczne Bóg zaplac i niech Wam Bóg blogoslawi. ~Klaudia A. Zarzycki i rodziny.